Or put another way making mistakes, always making mistakes. I have two projects on the go, one is an overhanging wall down in darkest Wicklow and the other is a plumb vertical (1 degree overhanging actually) wall on tiny holds in the Quarry. With the weather and family life I have been able to get on the Quarry proj a lot more as I can be shoeing up under it 15 minutes after leaving the house. Forgive me if I’m being a little vague about the exact location of both these problems but I feel it’s best not to tempt fate. I first tried the Quarry problem in 1998. Climbing wise I have a good memory and I never forgot about it and so last spring, after just over 15 years, I started working on it again. In ’98 I only had a few sessions on it and never made much progress. On my return I found I could still remember the holds but it didn’t feel any easier. Through the course of last spring I had a few sessions on it. Because the holds are so tiny it’s very conditions and skin dependent. None of the holds are deeper then first joint, most are half that and you can only get two fingers at most on them and they are sharp as well. The whole problem revolves around getting this sloping edge about 10 feet above the ground. The starting holds are decent and it’s just a matter of finding a good position to make the reach. At first I couldn’t even hit the edge but slowly I made progress. On the good days I would try what I though was THE sequence and just try and refine the technique but some days that sequence felt too hard so I would get a bit demoralised and start playing around, trying to find a different way. Now there are only 6 hand holds and 3 foot holds so there aren’t a huge number of permutations and I’d say I tried the majority of them. Once the weather started to get a little warmer I put it on hold until the start of this winter. So far I have about half a dozen sessions. I had settled on a sequence involving a terrible pinch, I could barely hold it at the start but am now able to reach from it and slap the sloping edge. This in itself was progress but with it came the realisation that the reach would have to be done absolutely static if I wanted to stick the edge. This two steps forward, one step back progress is typical of this, and probably most, projects. You don’t really progress in a linear fashion towards your goal due to the interplay of various factors such as form, training, conditions, psyche etc, not to mention these discrete steps, both forward and back, caused by sequence revelations. Doing the reach static from that pinch was always going to be a big ask and I started to wonder if it was out of my league. With the new energy and motivation that comes with the New Year I started to focus on getting this thing done or at least giving it my best shot, so rather than just set myself the goal of doing it I decided to set myself the goal of trying it at least 8 time in January. At the end of the month I could then assess how I was getting on. A pattern developed where my first go was often my best, this could of been due to my skin being good. But it was a little strange. I started warming up on the finger board at home, this must of helped and when I didn’t do this it took a good few tries before my fingers felt strong which was a waste of skin. I also started using a nail file to keep my skin smooth. You have probably seen videos in which the wads spend as much time filing their skin as climbing. It really works. In my last session I realised that the position in which I reach from makes it very difficult to keep my body close to the rock and dead still. So once again I started messing around with different methods. I tried a different sequence, moving my right hand first then my left, skipping the terrible pinch, as soon as I did this I realised that my shape was much better and that I could get a high right foot which would allow me reach statically to the edge. It was a great moment, the first time I really believed I could climb this thing. It’s not going to be easy but I think it will go. In the space of a minute I went from thinking my sequence wasn’t going to work to being pretty sure that I would be able to do it. Now for the first time I could start to anticipate what it would be like to stick that edge and break onto new ground. I had tried that method before but it didn’t click. Maybe I wasn’t committed to it, or maybe I needed to have that little bit of extra strength, it’s hard to say. It’s not intuitive, to me at least, that the optimal sequence would involve less holds and less hand movements rather than more, especially on a problem where the holds are so marginal. Climbing hard problems (and developing bouldering areas) is like peeling back the skin on an onion, layer by layer more gets revealed but it can’t just happened in one go, you can’t really force it. This is why I think flashes of hard problems are a real display of virtuoso, there is some many things that have to be perfect for it to happen and you only get one shot. Now to force a conclusion and moral out of these ramblings. – You don’t have to be a wad to adopt their tactics, doing so will serve you well. – Bouldering, especially doing first ascents, is a thinking sport. Danny Barrios – O’Neill has written a round up of the last year of Irish Climbing. The first of hopefully many issues of this ezine is free to download here. This is a great initiative by Danny, all too often in the Irish climbing scene news doesn’t spread far. 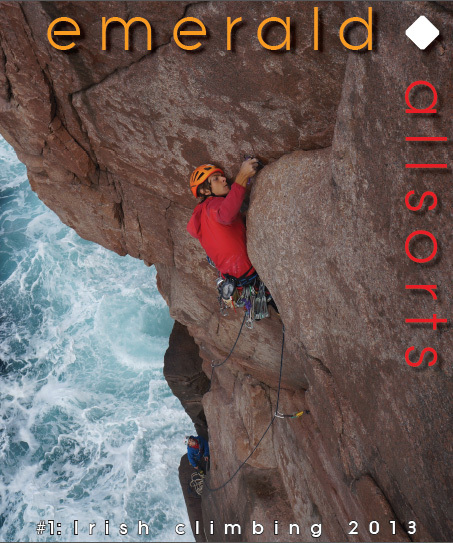 “This little e-zine was born out of a love for rock climbing in Ireland. It’s a fledgling attempt to capture the essence of happenings on the rocks of this island in 2013, or thereabouts. Please feel free to download it, share it, print it, or host it on your website. If you like what you see, or have any feedback, then let me know either via the poll, a post, or both. The flat bogs between the mountains and the sea in Galway are vast empty and studded with boulders. 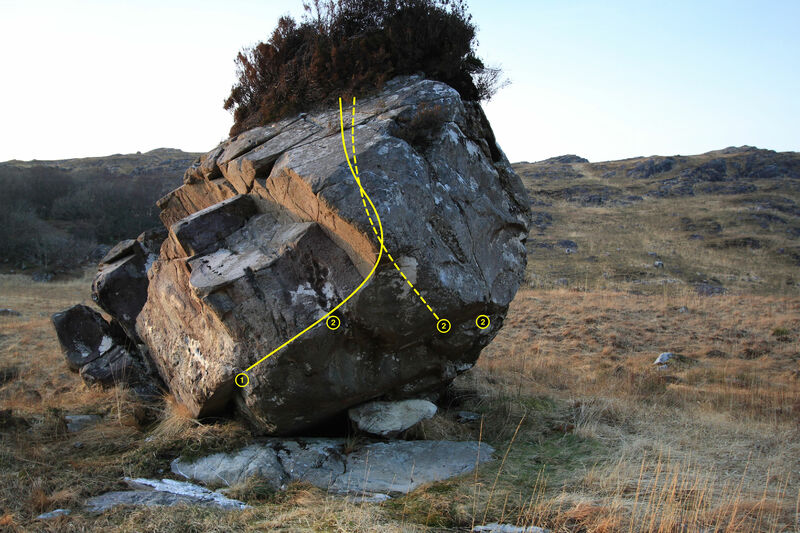 Only one area has really been properly developed – Derryrush – but it always seemed unlikely that there wasn’t loads more bouldering to found. Over the years various people have done bits of exploring but no one has found, or at least told anyone else, a major new area. I spend ages poring over various satellite photos a few years ago and spend a day driving around checking a few places out. I found a few big boulders and lots of small ones. Part of the problem with the granite in this area is that it’s quite rough and often flithy. Slapping to slopers on this rock is painful. The rock is more suited to highballs on decent holds – Highawatta on The Chief is the perfect example. It’s surprising that it has taken so long, after all the area is only a short drive from Galway City which has a distinctive lack of good bouldering close by, but there seems to be a few people starting to explore the area now. 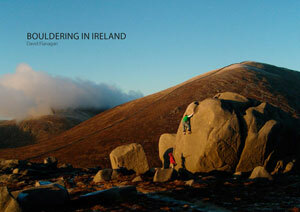 And there was some more information posted on the Galway Climbing group on Facebook recently. I have gone through the guide and assembled the following list of the hardest problems in Ireland. All grades are as per the guidebook. Feedback welcome. Diagonal Alley 7C first ascent from Dave Ayton on Vimeo. Gaz Parry, no doubt still feeling the glow from his flash of Leviathan, did the first ascent of the line just to the right of Lemon Sole in Portrane. Going at 7c there is also a possible link-up into Lemon Sole that will bump the grade up a few notches. Dave Ayton who filmed the ascent said that Portrane is in absolute mint condition at the moment. 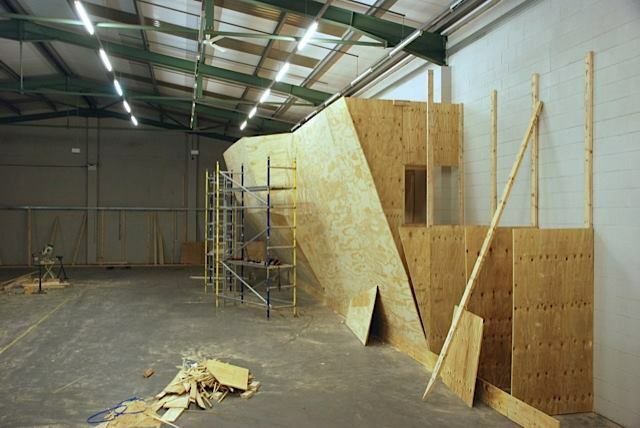 Work is about to start on Boulder World Belfast, Northern Ireland’s first bouldering centre. Leviathan – aka The Arch – in Portrane was flashed this afternoon by visiting wad Gaz Parry. Parry, who was in Ireland to set for the National Lead Championships, took a quick break from setting at Awesome Walls to visit Portrane. Dave Ayton took him through the sequence and chalked the holds and after a very brief warm-up, Parry breezed through the moves first time. The previous day Parry had visited the Scalp and repeared Space Machine, 7c. Leviathan was recently repeated by another visiting wad, Dave Mason, and apparently he reckoned it’s solid at 8a. Danny O’Neill has done the extension to Once Upon a Time in Mexico one of the classics of the Cooleys. Danny, putting his newly accquired parenting skills to go use, employed a nappy to dry a seeping hold. Not used I assume. 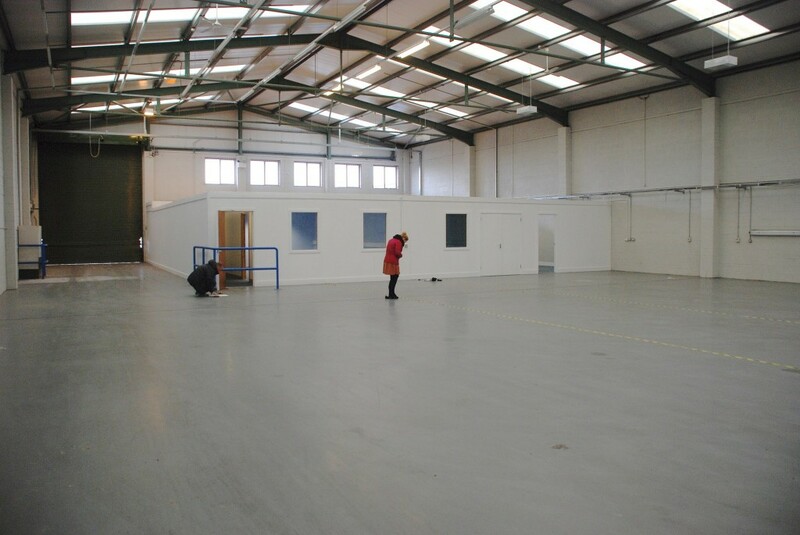 The extension is around 7b and called Deya. The boulder has a long roof and the ground slopes with it. 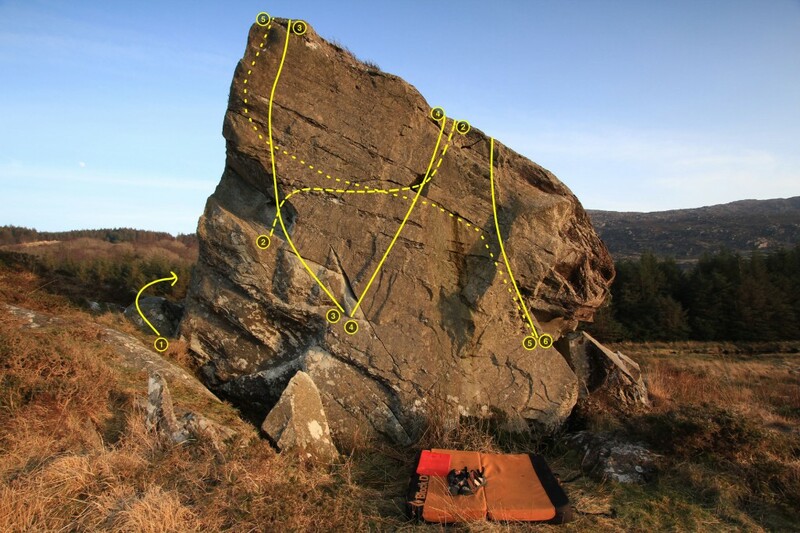 It’s well suited to link-ups and there are now 6 problems on 2 projects on the boulder. Danny has also drawn up a topo detailing the problems on the Mexico block (unfortunantly just too late to go into the second edition of the guide). It also contains decent directions to the boulder. The guidebook is a little vague. Danny is also working on a new area but he’s not ready to tell the world about it yet. But it looks good.